Dodge Brand President and CEO Ralph Gilles and plant manager Shelly Brown Gordon welcomed more than 400 hundred loyal Viper owners at the Conner Avenue Assembly Plant in Detroit today to present the ultimate factory customized 2010 Dodge Viper coupe to proud new owner D’Ann Rauh. Rauh and her husband Wayne from Arp, Texas, own more than 40 Dodge Vipers – the largest personal collection of Vipers in the world. A member of the Mid-South Viper Club of America, D’Ann Rauh worked exclusively with the Dodge Design team to select the personal touches she wanted on her car. The custom bronzed gold exterior paint was supplied by House of Kolor. The custom interior features various leather appointments, which were crafted by Tony Spampinito from Venzano, who has worked with the Rauhs on previous Viper projects. Bob Soroka, from Chrysler Group LLC’s Street and Racing Technology team, airbrushed layouts of Viper-significant race tracks into the custom-painted copper stripes applied by Prefix. The five-spoke forged-aluminum wheels are custom painted in dark graphite. Members from both the Motor City Viper Club and the Viper Club of America participated in the celebration. Rauh’s Viper is the last of the current-generation Vipers built at the plant. 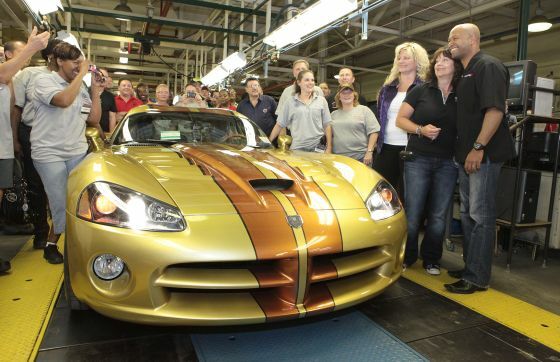 Dodge has created more special-edition Viper models for the 2010 model year than all other model years combined. Production on the Dodge Viper started in 1992.